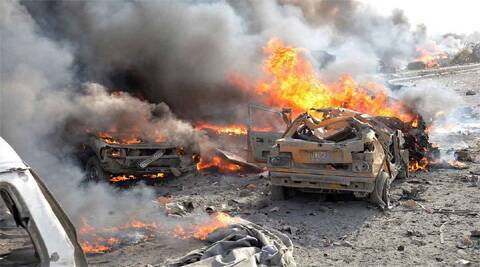 The Syrian rebel group confirmed the attack on Twitter, saying that their commander, Adnan Bakour was killed. Syrian activists say al-Qaida fighters have killed the military leader of a rival Islamic brigade in a twin car bombing near the northern city of Aleppo, an attack likely to further exacerbate rebel infighting. The Britain-based Syrian Observatory for Human Rights said late Saturday that the al-Qaida linked Islamic State in Iraq and the Levant killed 26 people on Saturday attack, near the base of a rival rebel group. The Syrian rebel group, known as the Tawheed Brigades, confirmed the attack on Twitter, saying in an interview they posted that their commander, Adnan Bakour was killed. A coalition of rebel groups has for weeks been fighting the Islamic State, a group resented by many rebels for its perceived arrogance and extremism.